THE FIRST COLLECTION OF THE NEW DC SERIES IS HERE! 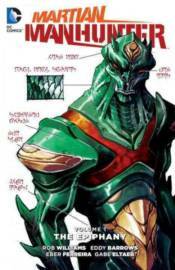 Trust no one as the Martian Manhunter tries to stop ruthless alien terrorists from destroying our world! But to stop the Martian invasion of Earth, J'onn J'onzz must make the ultimate sacrifice. And when the Martian moon Phobos falls into Earth's orbit, the invasion kicks into high gear! Guest-starring Superman-who demands to know what J'onn J'onnz knew about the Martians' terrible plans for Earth. Collects the first six issues of the new series, plus the Sneak Peek story from CONVERGENCE: ADVENTURES OF SUPERMAN #2.